Got a jar full of old coins? You may have some valuables in there. 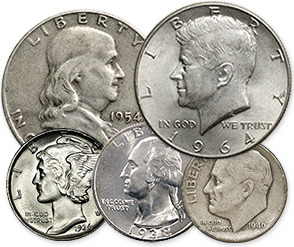 Dollars, half-dollars, quarters and dimes dated 1964 or earlier were made of 90% silver, which makes these coins worth much more than their face value today. 650-GOLD is one of Cleveland's leading buyers of old coins. We're not worried about their condition – tarnished and worn-out coins are welcome. Silver dollars dated 1935 and earlier including Morgan and Peace Dollars. Turn your old pocket change into cash today. Stop by our convenient Northeast Ohio location, or call 216-650-GOLD for more information.